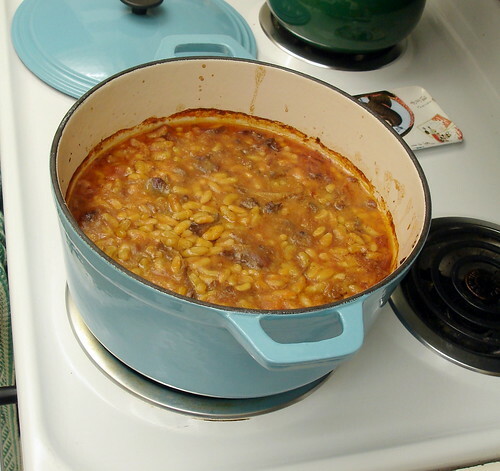 Here is my own variation on cassoulet, the classic French winter casserole. It’s strongly influenced by the Bourdain version in his Les Halles cookbook but I’ve made some changes to suit my own tastes. 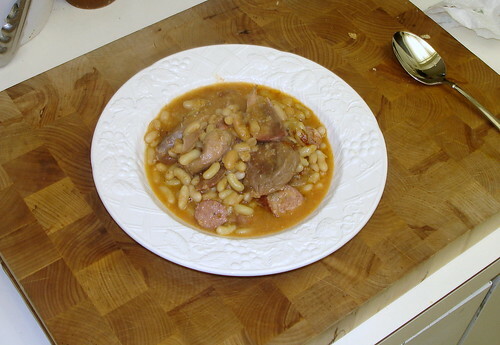 For example, the lingering ghosts of my kosher upbringing pushed me towards creating a version of cassoulet with as little pork as possible – if you used beef bacon, this dish could even be entirely pork-free. If you are a fan of the pig, then feel free to ignore my pork hang-ups and use pork sausage and/or pork shoulder instead of the lamb. The French have a number of variations on this dish, so don’t consider the choice of meats set in stone. They’re not. 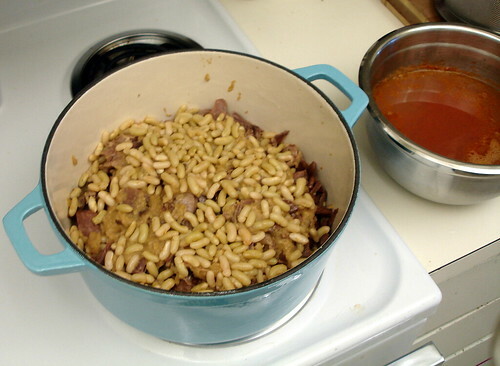 Cassoulet is not a difficult dish to make. Its biggest challenges are sourcing the ingredients and the fact that it takes several days to put this dish together. If you have access to a good local specialty store (or plan far enough ahead to buy what you need online) and a little patience, your reward will be a hearty dish full of flavor, comforting and festive. Place the beans in a bowl, completely cover with cool water. These beans are thirsty so don’t be meager with the water. Fill the bowl until there’s about 2” of water above the beans. Soak overnight. Drain and rinse the beans. Place the beans in a large pot and cover with cold water. Cut 3 strips of bacon into 2-inch pieces. Make a bouquet garni for the herbs (not required, but helpful). Add the thyme, bay leaves, carrot, onion, cloves, tomato paste, salt, pepper, and bacon to the pot. Bring to a boil on high heat. Once it’s boiling, reduce heat to a simmer and cook for 45-60 minutes, until the beans are tender but not mushy. Turn off the heat and let the beans cool in the liquid for about 20 minutes. This helps keep the beans from losing their skins. Strain the beans into a colander with a bowl underneath to collect the cooking liquid. 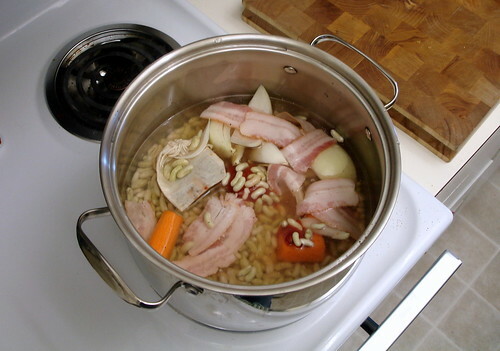 Remove and discard the bacon, bouquet garni and vegetables. Save this bean liquid. You’ll need it later on. Put the duck confit in a sauté pan over low heat to melt the fat. Remove the duck pieces, drain on paper towels, add the rest of the duck fat, and turn up the heat to medium-high. 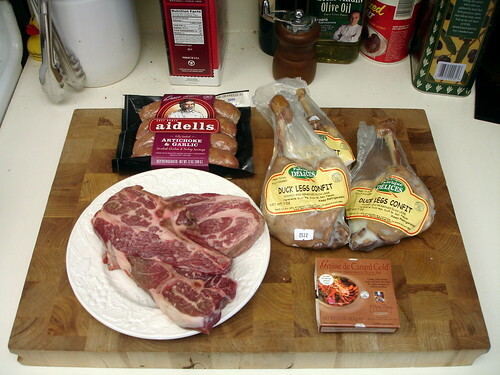 Sear the lamb pieces on all sides until golden brown, and then put them on the plate with the duck. Next, the sausages go into the pan. I keep the sausage skins on for a little extra texture, but you may want to remove them. Brown them, then add to the pile of meats to drain. Finally, lower the heat to medium, and put the sliced garlic and onions into the pan. Cook until golden brown and translucent. Deglaze the pan with the white wine. Strain the pan liquids and pour them into a blender with the garlic and onion. Puree until smooth. 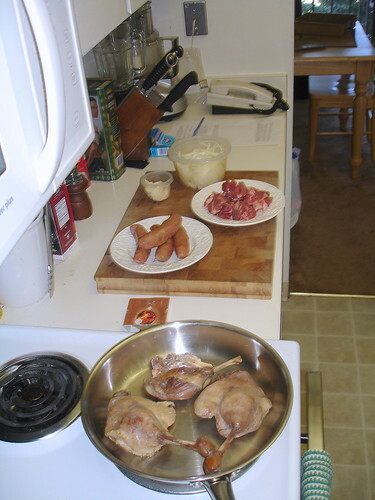 Debone the duck legs and break the duck meat into smaller pieces for easier eating. Also, slice the sausages, ditto ditto. You don’t have to do this, but it definitely makes the dish easier to serve and eat if you do. Now, it’s time to bring all these elements together into one glorious whole. Preheat the oven to 325 degrees F. Place bacon slices on the bottom of a deep, heavy, ovenproof casserole dish (8 quart, enameled cast iron is best), slightly overlapping them. Cover the bacon with a layer of beans, then a layer of sausages, more beans, then the lamb, then beans, then the duck, then more beans. Add a little of the garlic/onion/fat puree between each layer. Finally, pour on enough of the bean cooking liquid to cover the beans. Make sure to save about 3/4 cup of the bean juice for basting during the final cooking. Bake for 90 minutes. Remove from the oven, let it cool, cover and refrigerate overnight. Let the cassoulet and the basting liquid come to room temperature. Preheat the oven to 350 degrees F, uncover the cassoulet, and put it into the oven. Bake for one hour. Then break the crust with a spoon and baste with the remaining bean juice. Bake for approximately another 15 minutes, until the top has become crusty and golden brown. It’s better to avoid the fancy flavor-smoked bacons for this dish. Definitely buy thick-cut, though. If you can’t find Tarbais beans in your local specialty store and don’t want to buy them online, flageolets or similar white beans will work too. Rendered duck fat adds an amazing flavor to food, which is why you use it. If you can find duck confit locally you should also be able to find duck fat as well. If not, it’s available online. I use Aidells Artichoke and Garlic sausage, but as I said above, suit your own tastes. Just make sure you buy decent-quality stuff.